Also just out of the box, new in for test from Berghaus, the Extrem Down Duvet. This is something a little different for me, I rarely get to test the more “regular” stuff, but at 710g this fatboy of a mountain jacket isn’t going to upset me too much this winter. 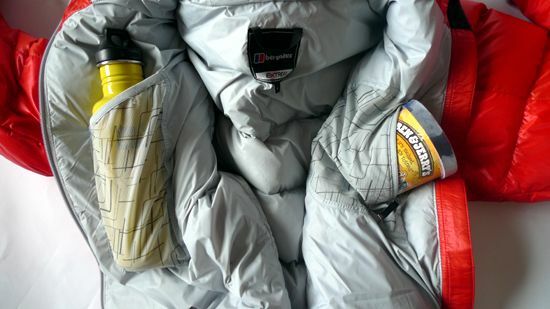 Like the Ignite Hoody covered in the previous post, the Duvet is simple and neat. A fixed front-and back adjustable hood with a nice big peak (all of which I like), two handwarmer pockets and velcro cuffs. There’s some neat touches though, above you’ll see the internal pockets. Both in stretch mesh, one with a lycra-bound top to stop your bottle freezing and a zipped entry one to thaw your Baked Alaska. 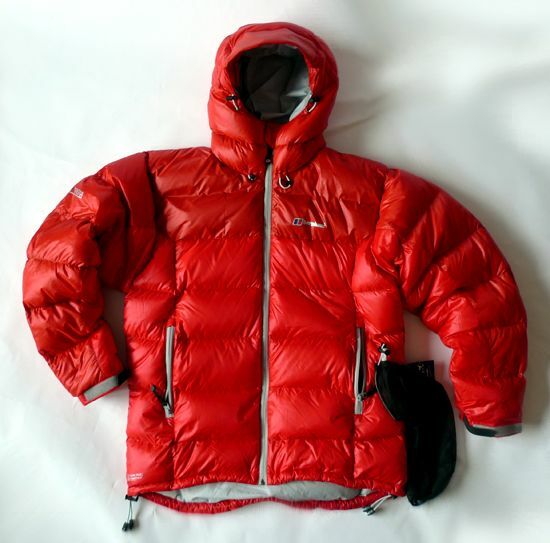 The cut is a little looser to pull on over your other layers, the Pertex Microlight makes for a good outer too. I put on on and absent-mindedly put my arm under the running kitchen tap to see what happened. The water ran over the sleeve and when I moved my arm away the beads sat there and didn’t absorb before I shook them off. Damn, all this new Pertex is good. The down is quoted as 700fill and the stitch-through tubes feel nice and fat. There’s some nice lines baffling around the arms and sides which’ll keep the down from shuffling up the tubes with a lot of body movement. The reversed zips have chunky zip-pulls and the hem can be adjusted front-or-back individually, again with chunky cord-grips. On a personal note, the light grey zips and cheery red outer make it look awfy retro, and whether that was intentional or not, well done people. This’ll look nice with a grinning face in the hood, clear blue skies above it and pure white snow underfoot. Hold that thought and I’ll be back with it just as soon as I can. You’re right about the inverse snobbery thing but unfortunately you’re also right about bigger companies having a bigger range the majority of which is dross. That you generally only find the dross is of course down to that other gripe that has been mentioned here before (with good reason) you can’t seem to get retailers to stock the good stuff. That said the companies themselves have to take some of the blame, if they concentrated on the top line stuff like the smaller companies do and got shot of the fashion wear then their top line stuff would be easier to find or less likely to be overlooked. Berghaus still make good kit, I tried a waterproof jacket in one of those end of line stores a while back (model name Dunedin I think) Similar in cut to a Rab Bergan/Montane Venture etc but with a better hood design, especially the visor which wasn’t cut to feck to look nice or provide peripheral vision which is hardly a consideration in horizontal rain unless you’ve lost the ability to turn your head. Lets face it, if you can see past the sides of the visor it isn’t doing it’s job. I’ve discovered it’s the nature of business. Talking to Mike Parsons and Peter Hutchinson especially you can see how a small operation making great gear creeps up to needing staff to fulfill orders, then needing investment to cover new premises with more staff, then costs being so high you sell up, go out of business or go overseas. Looking back it must be easy to see the pattern, but at the time it’s just day to day business development I suppose. So what we end up with is companies with a large numbers of employees and not a big enough technical market to sustain them, hence the dogwalker and lifestyle gear. Also when investors buy a brand they want to get the most out of it and trade on just the name itself, the worst case of that being Karrimor after 2004. What we’ve got to hope for is a real passion still in the copmpany owners to produce the top gear for real users, and with the Begrhaus Extrem kit I’ve been eating my hat regularly since the first pieces arrived for test earlier in the year. I should have a look at their MtnHaus kit soon as well. I’m set to do one of my meet n’ greet/show and tell’s down at Berghaus HQ soon. Beth, it’s two shades of very red! Yep, it is a catch 22 and very easy to criticise when your not the one with the investors knocking at the door, frustrating none the less when you know that there’s good kit out there but you can’t get your hands on it. 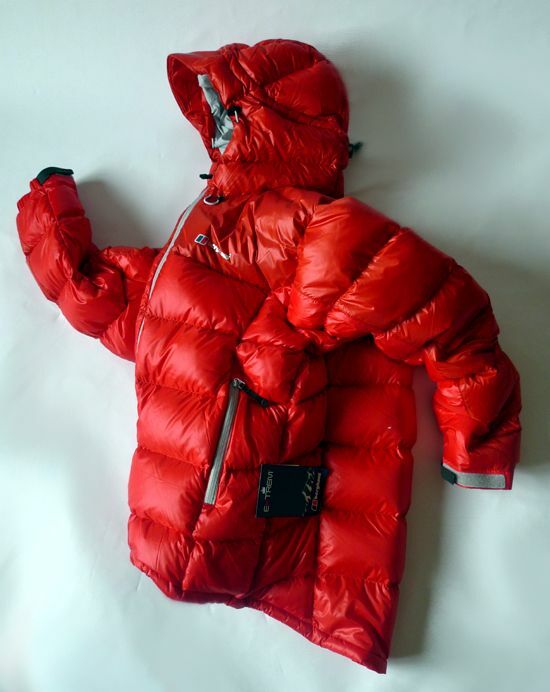 If I didn’t have such a cracking couple of warm jackets I’d be very tempted by that – a black PHD down jacket and a Haglofs Barrier Q Hoody in red. “There’s good kit out there but you can’t get your hands on it”. Aye, I’ve seen quite a few casualties in the line-ups that are making it into the shops this winter. Orders are down, the buyers are looking even more conservative. I wonder how it’s all going to play out. Beth, that’s a very good point there. New gear doesn’t mean your existing gear is somehow less than it was (even if the advertising wants you to think that). I’ve still got my favourites too. Aye, I haven’t bought kit for a while now(*), cant buy anything until I’m earning again anyway. Manufacturers need/have/want to keep fiddling with stuff so that enough fashion victims keep their turnover/profit figures in the positive. I know sometimes it’s evolution; better shape hood, or zips with a positive seal type fiddling about. Maybe I just like to find revolution when I buy new stuff. * but I have given Father Christmas the nod for an early purchase of PHD’s down mitts. And yes, don’t believe the hype! A nice looking jacket – but a bit of a porker. I think I will stick with my PHD down jacket. The only issue with the PHD is the hood – could be a bit more technical – like the hood on my Flux. I fancy the PHD down trousers – pure luxury !! That looks real purdy! It’s a pity the Berghaus boxy cut doesn’t suit me. For a belay jacket I would have thought synthetic insulation would be the way to go in all but real high altitude environs. The internal stretch mesh pockets are totally perfect though! Great for drying out gloves. Other manufacturers take note! True, it’s probably a bit much for most people but, like the Montane Resolute smock, sometimes it’s nice to have stuff that can cope with the absolute worst conditions Hollywood can imagine! holycow, I too was pleased! I wanted to show the drop-tail, and it kend of went to “stick-man in peril” from there. Holdfast, it’s always a dilemma the down/synthetic thing. I’ve seen down reduced to soggy mush in a stuffsack (not in my rucksack I might add…) and I’ve wished I’d been warmer in a sythetic top in winter. Talking of the Resolute, a merino short-sleeve, the Extreme smock and ths duvet is a great winter combo, the sizing is spot-on for layering. The Highlands were golden brown yesterday, soon for the winter stuff, soon. How did Bobinson get on in the race?! I’ll stick with my Rab down jacket, I love it. And I don’t think my Ben n jerrys Fairly nuts ice cream fits in the inside pocket though – boo. I have photies and a story from Bobinsons race. Quite a day for the boy, I try and get it up here over the next couple of days. I got to cut about the hills, drink Irn Bru and eat steak pie too. Tent, aye. I hope you didn’t put it in the washing machine.